It was the moment so many Jeep lovers had been waiting for! 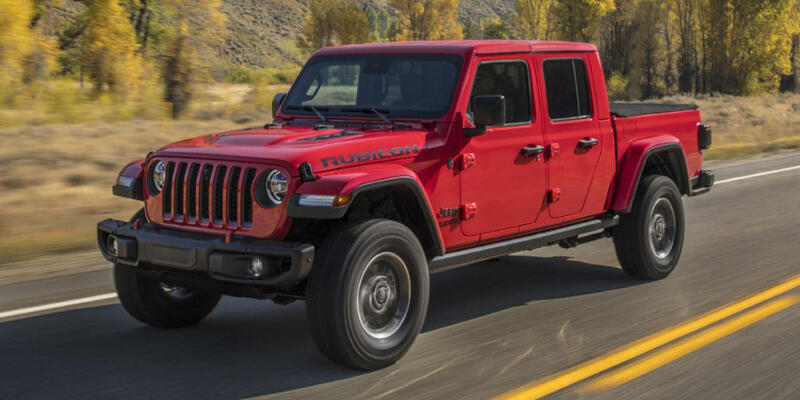 On November 28, the 2020 Jeep Gladiator was revealed at the Los Angeles Auto Show. 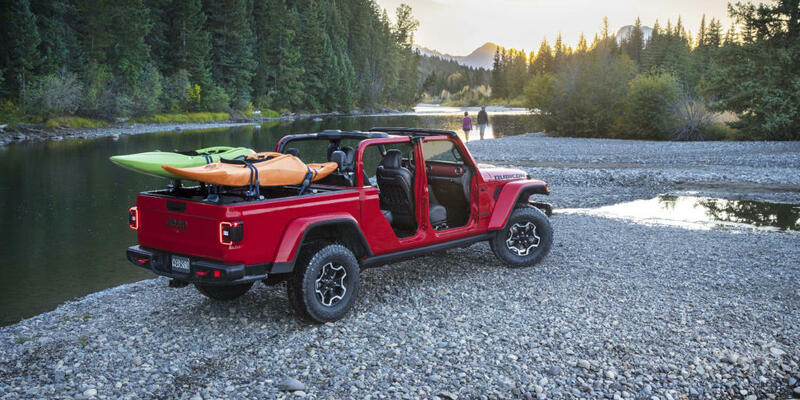 It’s based off the Jeep Wrangler off-road sport utility vehicle, but it also carries on the rich heritage of Jeep trucks with legendary 4x4 capability, best-in-class towing, and 4x4 payload with open-air freedom. Jeep calls it the most capable midsize truck ever! 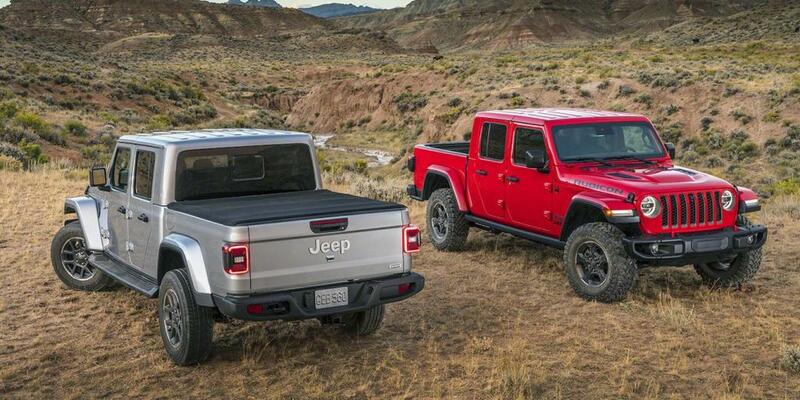 The 2020 Jeep Gladiator is available in several different trim configurations: Sport, Sport S, Overland, and Rubicon. It’s being built in Toledo, Ohio, and it will arrive in showrooms in the second quarter of 2019! You can definitely see how Jeep incorporated design cues from the Wrangler in this new Gladiator truck. The design team kept the legendary seven-slot grille of the Wrangler, for example, but widened the grille slots for additional air intake to help with the increased towing capacity. 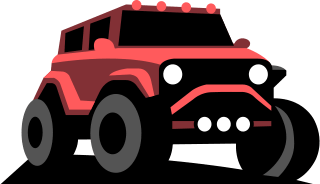 If you opt for Gladiator Overland and Rubicon models, know that those come available with LED headlamps and fog lamps to better light the trails ahead. They also help give the Gladiator a more modern look. From behind, traditional square tail lamps feature available LED lighting and give way to a wide tailgate opening that helps make loading cargo simple! 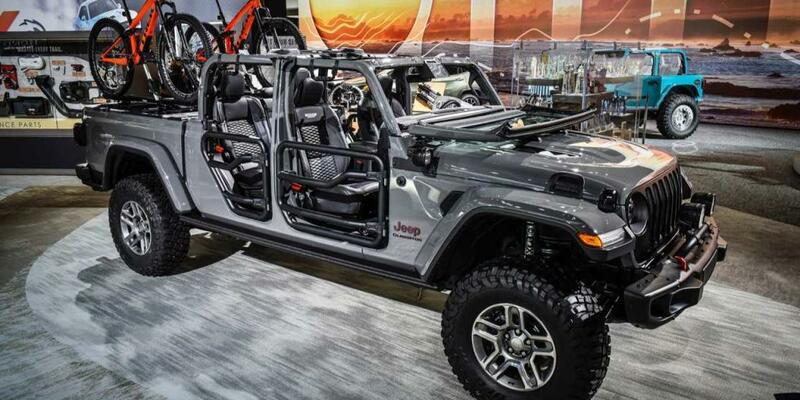 There are dozens of different door, top, and windshield combinations allowing for endless configuration possibilities! A premium Sunrider soft top provides a segment-exclusive easy open-air option and allows for access to partial and full open top positions. The soft top features retainers that slide into a track for easy rear window removal. A black three-piece hardtop is also available on all models, offering even more options for open-air driving. The two Freedom panels and quick-release latches make removal and installation of the hardtop a breeze. Removing the doors on this Jeep is also simple, thanks to the Torx bit size being stamped directly onto the hinge to eliminate guessing which size bit is needed to remove the doors. A toolkit with the necessary bits to remove those doors, as well as lower the windshield, is provided as standard. Inside the vehicle, there’s authentic Jeep styling combined with versatility and comfort. High-quality materials can be found throughout the cabin. The heritage-inspired center stack, meanwhile, features a clean, sculpted form that complements the horizontal dashboard design. The instrument cluster features a 3.5-inch, or an available 7-inch, thin-film transistor information LED display. Integrated buttons on the steering wheel control audio, voice, and speed functions. Then, there’s the 7-inch or available 8.4-inch touchscreen which houses the fourth-generation UConnect system. It sits prominently atop the center stack. Directly below the touchscreen are more functional features, like climate and volume control knobs, and media connectivity ports. All-new rear seats, which are exclusive to this new Gladiator, feature segment-leading rear legroom and utilize a unique design that can be locked in place to provide secure storage behind the seat back. The rear seats can also be folded flat to access cab-back storage and provide a load floor for larger items. 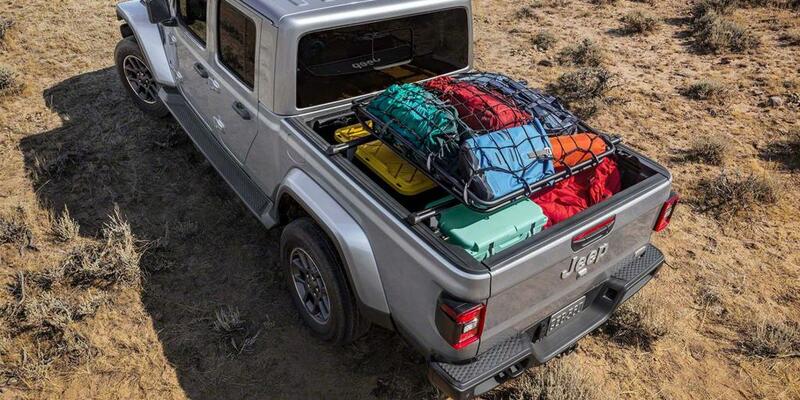 As for storage, clever solutions can be found throughout the 2020 Gladiator! There are numerous mesh pockets that extend the entire length of the doors, for example, and there are also a number of phone storage areas. Plus, plenty of USB ports to go around and a 115-volt AC outlet to help keep all your electronics charged and ready to go! The 2020 Jeep Gladiator utilizes a body-on-frame design and features a superbly engineered five-link suspension system. The advanced materials used to build this vehicle are lightweight, yet stiff and durable. When compared to the Jeep Wrangler 4-door, the Gladiator’s frame is 31 inches longer and the wheelbase is 19.4 inches longer. That longer wheelbase and the bed’s positioning center aft of the rear axle centerline enable for better weight distribution and a more comfortable ride, even when loaded down with cargo. Legendary off-road capability also comes courtesy of the Command-Trac and Rock-Trac 4x4 systems, third-generation Dana 44 axles, Tru-Lock electronic front- and rear-axle lockers, Track-Lok limited-slip differential, segment-exclusive sway-bar disconnect, and (how could we not mention) some awesome 33-inch off-road tires! The Gladiator also benefits from up to 30 inches of water fording, up to 1,600 pounds of payload, and up to 7,650 pounds of towing capacity with the available Max Towing Package. Talk about impressive! Now as for the Gladiator’s bed, clever functionality and versatility were the focus while designing it. Under-rail bed lighting, an available covered external power source, and strong integrated tie-downs provide durability and versatility. The all-new Jeep Gladiator is offering the proven 3.6-liter Pentastar V6 engine at launch, while a 3.0-liter EcoDiesel V6 will be offered later. The FCA US 3.6-liter Pentastar V6 engine delivers 285 horespower and 260 lb.-ft. of torque. It features ESS as standard equipment. A six-speed manual transmission comes standard on all Gladiator models equipped with this engine, but an eight-speed automatic transmission is optional. The company has produced more than 8.6 million 3.6-liter V6 Pentastar engines since production began in 2010. So, it’s a proven workhorse! Jeep says what’s so great about it is the low-range torque, which is needed when out conquering the trails in your Gladiator in demanding conditions! The 3.0-liter EcoDiesel V6 engine option, meanwhile, will be available starting in 2020. It will come standard with the eight-speed automatic transmission. As for safety, more than 80 available active and passive safety and security features are offered with this new Gladiator! Available features include blind-spot monitoring, rear cross path detection, a forward-facing off-road camera, standard ParkView rear backup camera, and more! We’re absolutely loving this new Gladiator! It’s just the latest iteration in a long line of Jeep trucks that dates all the way back to 1947, when Willys Overland introduced a one-ton truck with four-wheel drive based on the CJ-2A. We love how it still undeniably feels like a Jeep, but you get the extra benefit of having the bed to help you cart around all that you need! This Gladiator is definitely an off-road machine, and one people will be clamoring to get their hands on. It arrives in showrooms in the second quarter of 2019!